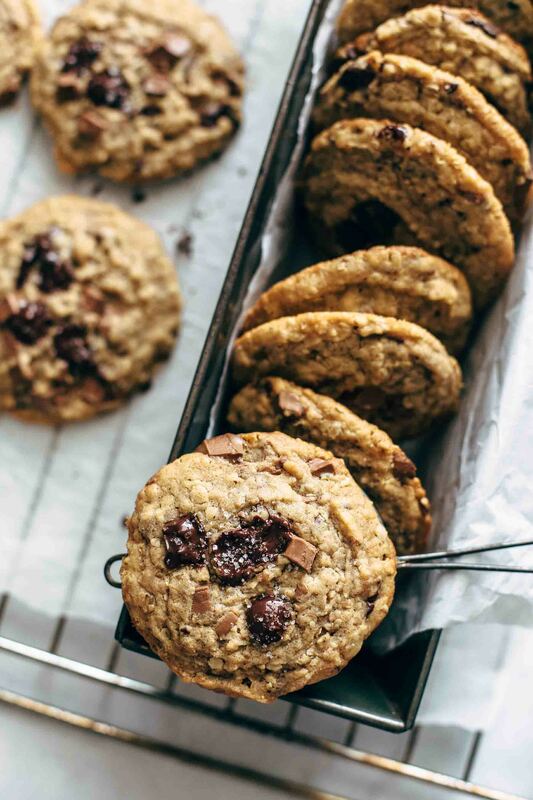 These Peanut Butter Oatmeal Chocolate Chip Cookies are super chewy. Just 11 ingredients and 10 minutes active preparation time. 2 cups oats, 2 cups chocolate chips, and 1 cup peanut butter! Don’t think we are entering the healthy baking area just because of the oats. Although I love to eat healthily, I love to bake with lots of sugar and butter. When I eat something sweet, I want allll the butter and sugar. Although I’ve never had serious weight problems, I gain and lose a couple of pounds throughout the year. Every year. But who cares. 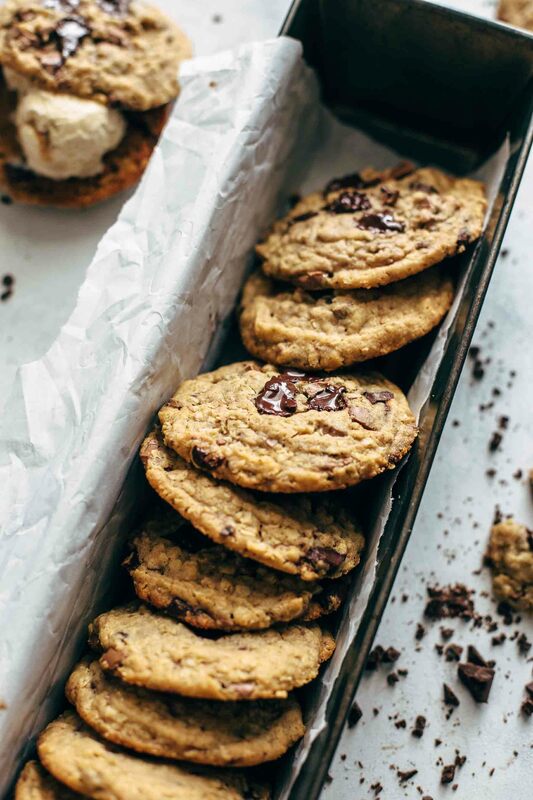 Let’s talk about these Peanut Butter Oatmeal Chocolate Chip Cookies. They are sent from heaven. I mean it!! 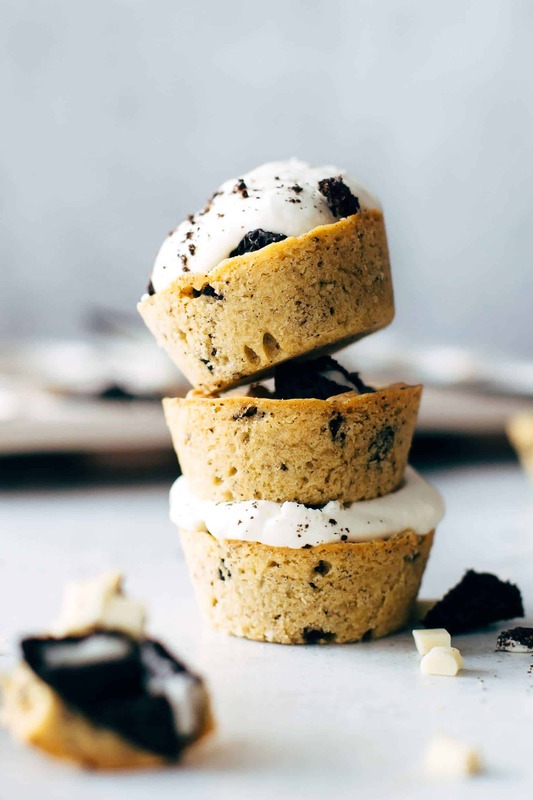 Big, chewy, and insanely delicious. 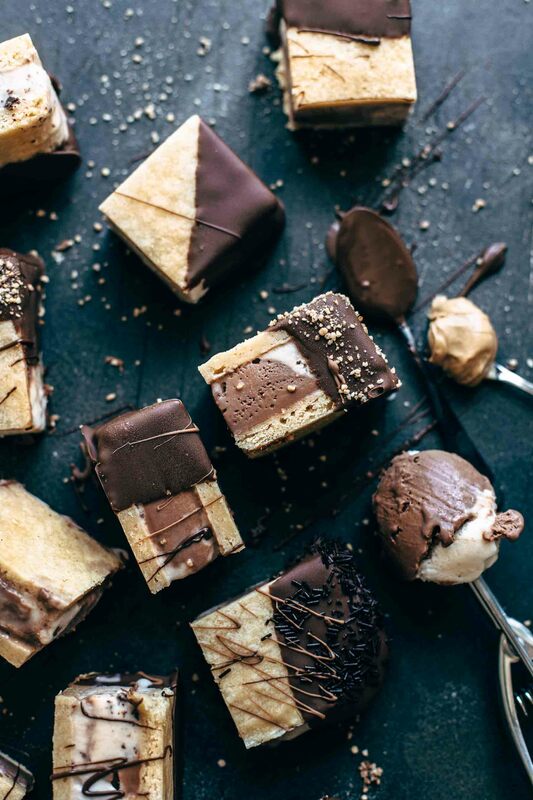 Peanut butter and chocolate is always a perfect combination, right? 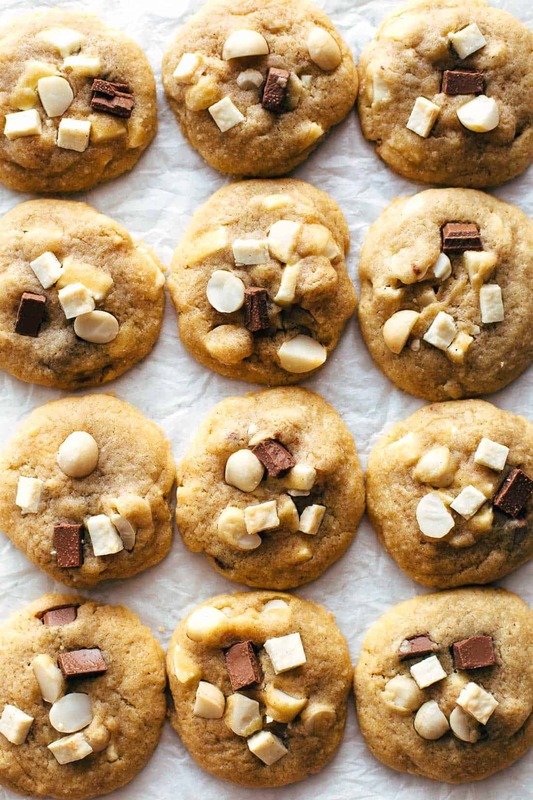 The cookie dough is very easy to make, and this recipe is a 1-bowl-recipe. And after 10 minutes of active preparation time, these babies are ready to bake. So they are easy, you don’t need to wash a lot afterward, AND they are prepared in a blink of an eye. Can it get any better? Start with melting the butter. I recommend melting the butter about 3/4 in the microwave. Then stir a few times until it is completely melted. The liquid butter makes sure that the cookies spread more throughout baking. 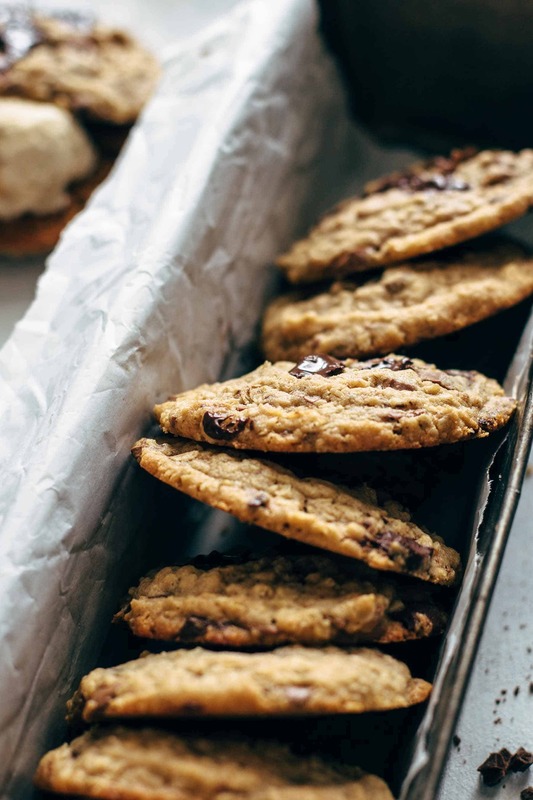 With room temperature butter these Peanut Butter Oatmeal Chocolate Chip Cookies would be much thicker. Thick is good, but I love to have these cookies not overly thick. Mix butter with sugars just until combined. In this recipe, there is white and brown sugar. I usually add more brown instead of white sugar to my cookies because of spreading and chewy factor. White sugar lets the cookies more spread, and brown sugar keeps the cookies more compact what leads to a chewier texture. 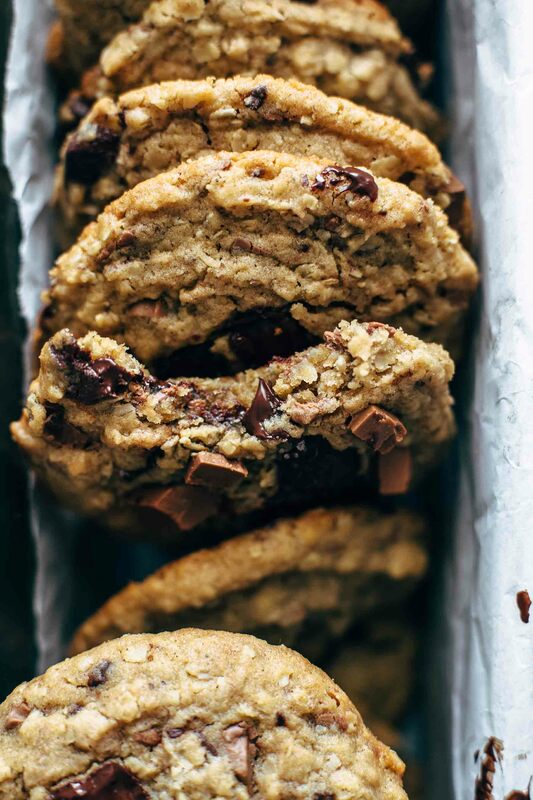 These Peanut Butter Oatmeal Chocolate Chip Cookies are beyond chewy because of the oats. And to change the white and brown sugar ratio let the cookies more spread. The cookies will be about as thick as a pinky. After mixing the butter and sugars, add eggs, vanilla, and peanut butter. Mix just until combined. I always use real bourbon vanilla beans for baking. It is up to you if you use them as well or pure vanilla extract. It is just my personal preference to use real bourbon vanilla beans. The texture of the Peanut Butter Oatmeal Chocolate Chip Cookies doesn’t depend on that decision. Now we come to the heart of the recipe: the peanut butter. Peanut butter is something I eat every week. When I eat somewhat like a smoothie or granola bowl under the week, I always go with homemade sugar-free peanut butter. All natural. For these cookies, I do not recommend using all-natural peanut butter because the consistency of the cookies doesn’t turn out well. The cookies are getting too dry, and the texture is crumbly. I always use creamy peanut butter from Skippy for baking. Add flour, baking powder, and salt. Then stir in oats and chocolate chips. This time I used chopped chocolate bars from Lindt instead of regular chocolate chips. It doesn’t make a difference if you use chopped chocolate or chocolate chips. Go with the one you like more. This recipe comes with 2 cups of oats and 2 cups of chocolate chips. The amount of the oats is just perfect to create a chewy texture but also not too much that it isn’t the only ingredient in the front. 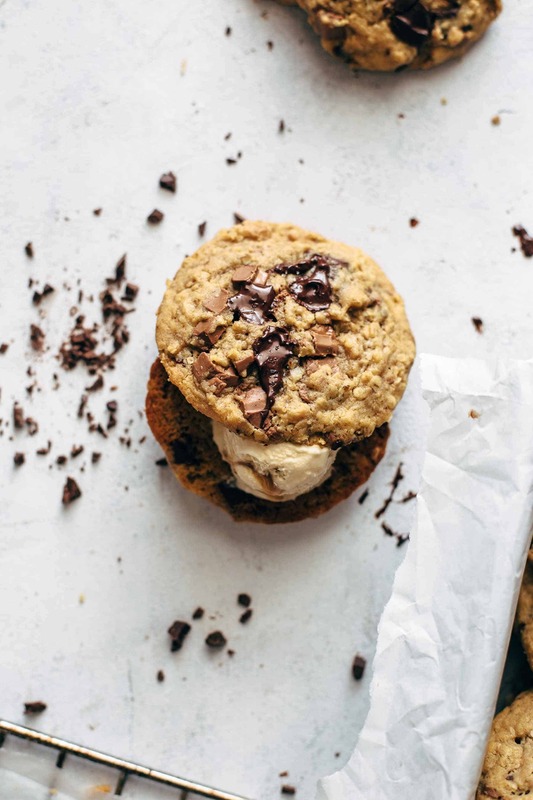 The name Peanut Butter Oatmeal Chocolate Chip Cookies is 100% representing the taste of these cookies. 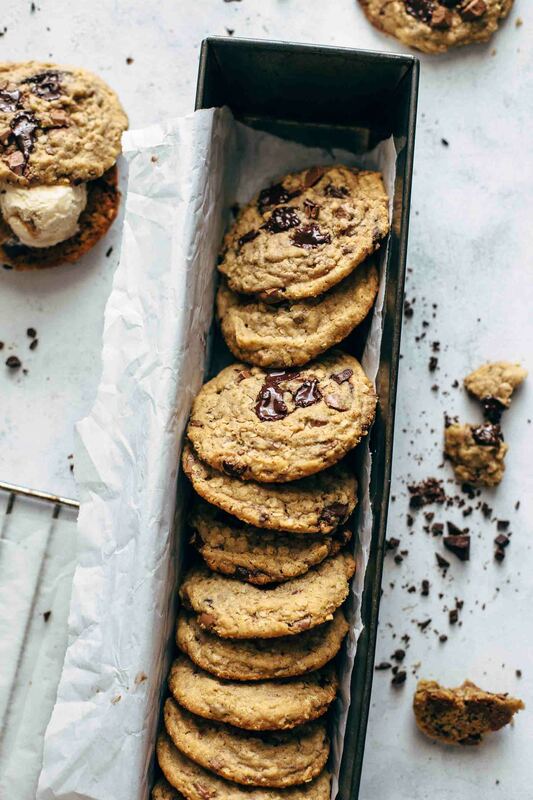 The peanut butter, the oats, and the chocolate chips are equal partners in these cookies, and no one is overpowering the other. I didn’t want these cookies to be just oatmeal cookies with a bit of peanut butter and a few chocolate chips. You know what I mean? Every ingredient has the right to have its place in the spotlight. 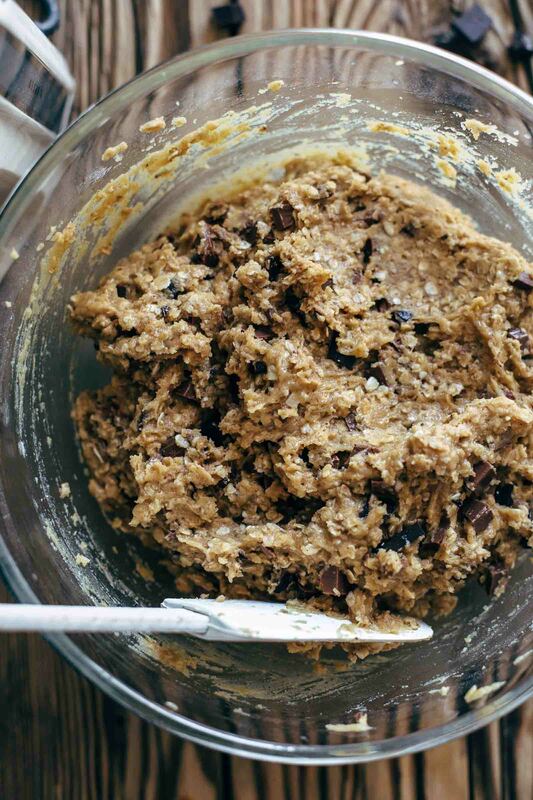 #1 Don’t overmix the cookie dough at any step or your cookies end up dry. Just mix to combine. #2 The cookies should be taken out of the oven when they start looking matt and dry but soft in the center. Baking the cookies too long leads to dry cookies. #3 Let enough space in between the cookies. Depending on the size of your oven and baking sheets, I recommend placing just 6-8 cookies on one baking sheet. If they are too close together, they spread together and don’t get crispy edges. And you want the crispy edges. We all want them. If you are in the mood for raisins instead of chocolate (yes it IS possible that this could happen) then add raisins instead of chocolate to your cookies. Or both? 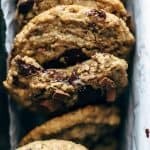 Make this Peanut Butter Oatmeal Chocolate Chip Cookies recipe and leave a comment, rate it and tag a photo #alsothecrumbsplease on Instagram! Would love to see your snap! 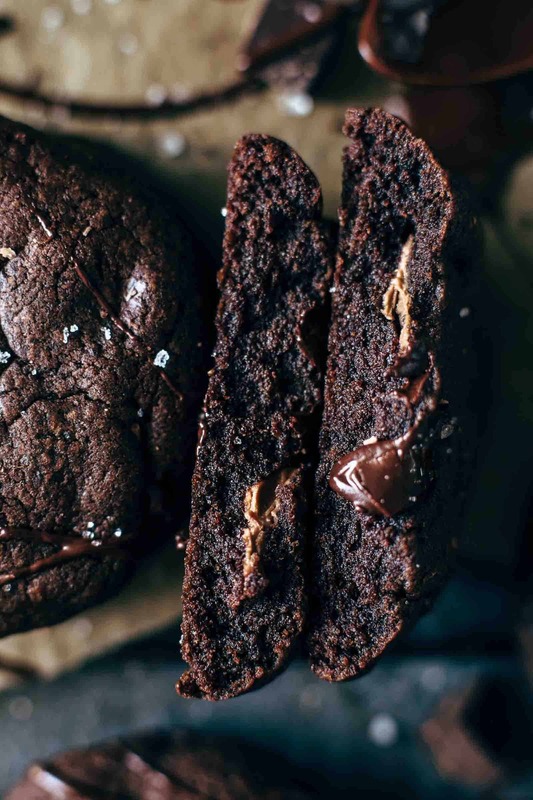 You may also like Super Fudgy Chocolate Brownie Cookies Recipe, Ice Cream Cookie Sandwich, Super easy Oreo Cookie Cups, Best ever Chocolate Macadamia Cookies, or click here to see all recipes. Preheat oven to 350°F (175°C). Line three baking sheets with parchment paper. Set aside. Microwave butter until 2/3 melted. Then stir until it's completely liquid. Transfer together with the sugars to a large mixing bowl and stir with a handheld or stand mixer fitted with a paddle or whisk attachment on medium-low speed just until combined, for about 1 minute. Add eggs, peanut butter, and vanilla* and mix for about 30 seconds just until combined. Add flour, baking powder, and salt and mix until incorporated. Don’t overmix at any step or your cookies will dry out. Slowly stir in oats and chocolate to combine. Scoop balls of cookie dough (about 2-3 tbsp of dough) and arrange 6-8 cookies on one baking sheet with about 2-3 inches space in-between. Bake one sheet after another for about 11-13 minutes. Remove from oven when they look puffy and dry and are very lightly browned on the edges. Let cool for about 5 minutes until they get firm enough to move them. Then transfer the cookies to a cooling rack and let cool completely. The cookies will stay fresh in an airtight container at room temperature up to 4 days. This is the best oatmeal cookie I’ve ever had. Over the top chewy! I’ve never baked oatmeal cookies with peanut butter before but won’t make it without anymore. Aww, Anessa, thank you so much! I’m happy that you like them as much as me! I’m so happy that you like them! I need to try them with white chocolate. Sounds delicious. Thank you so much for your feedback! Holy Toledo….easy to make, not much clean up and I’m surprised there is any leftover after testing this one and that one. Actually this makes a lot of cookies! The gang at work will LOVE THEM!!!! Thank you for sharing this recipe. Lorena, I’m super happy that you like the recipe. It’s my favorite cookie recipe of all. Have a great day!